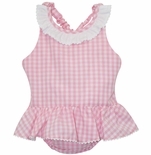 Your little one can enjoy the sun, water and sand in our childrens personalized swimsuits and classic smocked swimwear for babies, girls & boys. The pool and beach are so much fun for little ones and moms and dads want their children to be as stylish as they are protected from the harmful rays of the sun. 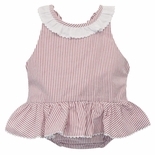 Why not choose one of our classic and traditional smocked swimsuits or for customization, a swimsuit that is personalized with your child's name or 3 initials in a big, bold and colorful font. 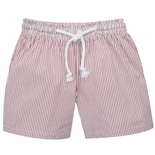 We love swimwear that uses lovely designer fabrics and traditional ginghams as well that will wear well and hold up to your little one's fun in the sun! 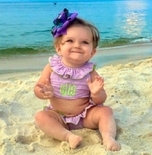 Our smocked swim garments and custom personalized bathing suits do just that.